Looking for good quality Muay Thai Training? People from all over have been training at Rawai Muay Thai since 2003. We are one of the most popular Thai boxing camps in Thailand. But why? What’s so special about us that is hard to find in other gyms? The answer might surprise you. Rawai Muay Thai is not just a gym, it is a family. Above all, Rawai Muay Thai is a family of trainers, staff and students from all over the world who live together and share a passion for Muay Thai. Students who come back year after year always mention the family atmosphere in the camp. They feel like there are “coming home”. Training with us is not just a sport or exercise; it’s a life experience that you will never forget. Secondly, many gyms in Thailand are foreign owned. The boom in Muay Thai tourism in the early 2000’s has led to a big investment of foreign capital in Thailand gyms. But Rawai Muay Thai has been owned and managed by Thai people from the start. Tuk (Sakeddao Sor Ayupinda), the owner of RMT, founded the gym in 2003. It was one of the first gyms in Thailand to teach foreigners and women. You can read more about the gym history here. Thirdly, the trainers make the gym a special place. We are lucky to have a great team of dedicated trainers who love to teach. Our Muay Thai Trainers teach the proper Muay Thai techniques, in a friendly and patient manner. We have a reputation for focusing on the quality of the Muay Thai training which has made us well known around the world. Another reason that makes Rawai special is its focus on tradition. Rawai Muay Thai is a traditional gym. We value tradition and Muay Thai customs. Tuk, and his brothers who all fought professionally as well, were brought up in fighting gyms in Bangkok. So in addition to the top notch Muay Thai training available in our gym, we emphasize other aspects of Thai Boxing such as Muay Boran and the Wai Kru ceremony, which is performed before every Muay Thai fight. 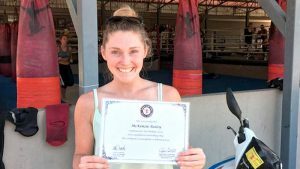 Furthermore Rawai Muay Thai is also one of the few camps in Thailand that offers a Pad Holding Certificate. For those advanced students who might teach back home, this is a must. Finally, Rawai Muay Thai is located in the beautiful and quiet seaside town of Khao Lak, about 1 hour North of busy Phuket. 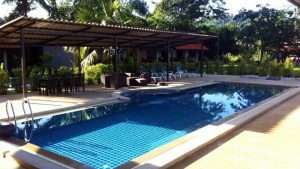 For those who want to party less and train more, this is the ideal location for your Muay Thai training holiday. 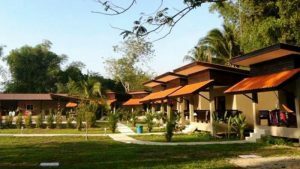 The camp is surrounded by tropical jungle and close to nearly empty beaches. The facilities are modern and comfortable, including spacious rooms, swimming pool, restaurant, massage hut and WiFi throughout the camp. Why do people train Muay Thai? Firstly, most people want to improve their fitness and to lose weight. Muay Thai provides an excellent workout that will burn lots of calories. Another reason is to get more fighting experience. Thailand is great for this. There are fights often so there are many chances to fight. In other countries you sometimes have to wait months to get a fight, but here we can organize a fight for you in a week or so. Finally some people come train with us to get certified to teach Muay Thai back home. We offer a pad-holding course that is just 10 hours long. You learn the best practices and the proper Thai Style of pad holding. Besides getting fit, losing weight and building muscle, Muay Thai has other benefits that are very important. First of all, learning to control your body and to protect yourself is an incredible booster in confidence. Especially for people who have experienced bullying or been victims of violence, Muay Thai can be therapeutic. Secondly, the high impact aspect of the training is a great stress reliever. Nothing beats a good session of punching and kicking to get your mind away from the worries in your life. Finally, a nice benefit to training together is making friends. 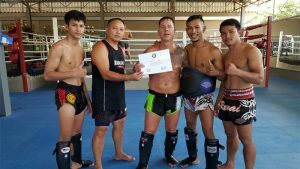 Rawai Muay Thai is a friendly gym that welcomes everyone and you can meet people from all sorts of life and from all over the world. Always wanted to try Muay Thai Boxing but thought that it was only for professional fighters? Scared to go into a Muay Thai gym for fear of being ridiculed or turned away for lack of experience or for being too fat, too old, too weak,etc? At Rawai Muay Thai we have always wanted to share the love for the Thai National Sport with everyone. Men and women from any country, of any level, from complete beginners to professional fighters are welcome to train with us. People of all ages can join our group classes or take private lessons. Everyone is welcome to train with us. There are more and more people doing Muay Thai everyday. Not only is it a fun way to exercise, but it helps to relieve stress and builds up your confidence and just makes you feel better about yourself. Women in particular have taken notice about the benefits of taking self defense classes and Muay Thai fits right into that. We offer daily Muay Thai group classes. Morning class starts at 7:30 am and afternoon class at 4:00 pm. These classes last about 2 hours and include warm up, shadow boxing, pad work, bag work, technique, drills, stretching and cool down. We teach different technique each day. Some days we do clinching, others we focus on Western boxing. We try to mix it up. Everyone trains together, although we do separate by levels during some drills, like sparring and clinching. Tradition and respect is at the basis of Muay Boran. Learn this ancient Thai martial art. Private lessons 700 Baht each. You can also take a Full Muay Boran Course with Certificate. Read more about this course. Learn the proper way to hold pads and get certified. This course is intended for intermediate and advanced students. Course length is 10 hours and costs 10,000 Baht. Learn more about course. Always wanted to fight in Thailand? Live the dream! Join our fight training program. It’s hard but so worth it. No extra cost but must ask our head trainer permission to join. Read more. Yoga classes will keep you flexible and help you to prevent injuries. It complements your Muay Thai training perfectly. Yoga classes 3 times a week. 350 Baht / class. Read more. 400-500 Baht per hour, depending on the type of massage you choose. If you are interested in training with us you can read our Frequently Asked Questions page. It is full of information that you might need to know before coming to Thailand. You can also read more about us, our gym history, our trainers, fighters and gym services here. We also include a brief Thai Language section, with basic Thai words and Muay Thai words for those interested in learning a few words in Thai. Might come in handy. Finally we offer our website in Italian, French and German. I recently did a short training stint at Rawai with one of my friends. I had an excellent experience training under the careful guidance of their knowledgeable staff. I used to hear from other people that some of the trainers in Thailand don’t care about the students, but this was certainly not the case at Rawai. I felt as though the Thai trainers at Rawai really cared about each person’s progression and you can witness the sheer joy and passion in their faces as they teach something they love to someone who is willing to listen and learn. The rest of the camp was great: location, accommodation and gear shop all made for a wonderful time. I’ll be back! I came for a week at stayed for 6. I guess that says enough. Very friendly staff and trainers. The one thing I was surprised about is the balance between men and women. In my time here it has been about 50/50 which was really nice to see. People train at their own pace. Some train really hard and others are a bit more relaxed like myself. A great place to do either. Many people keep coming back to Rawai Muay Thai and I am sure I’ll be one of them.